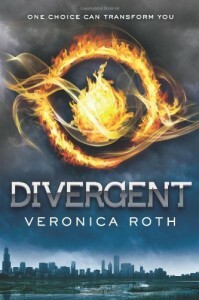 I didn’t really love Divergent when I first read it, but I liked it well enough to get the second book in the series. I must admit that I’m really more into it because of the covers because it would look nice on my shelf, but as for knowing what happens next, I wasn’t in a hurry to read it anytime. Call me ambivalent, I guess. That, and I may be one of the few readers who don’t have a fictional crush on Four. But anyway, Insurgent is the second book in the latest dystopian YA series taking readers by a storm. This book picks up immediately from where the first book ended, so I had to check the last parts of the first book before reading through this one to remember how things ended. The action was there at the start, and I was really interested in knowing what would happen to Tris and Four and the rest.Thing was, I actually forgot who the other characters were, so I kind of groped in the dark as I read on. I think my favorite part of Insurgent is really getting to know the other factions more. I liked their “field trips” between Amity, Candor, Erudite and even the Factionless. I liked seeing how the other factions worked, and how they supported how their world lives. My issues at how the world like this can exist that I mentioned in the first book still remain, but I guess I’m more forgiving this time around because I was curious about how their world operated. We see more of the villain and how cunning she is…but also, she didn’t give much dangerous vibes than I expected. She’s just…smart, but dangerous? Nope, didn’t feel like it. There were a lot of betrayals in this book though, and it was hard to know who to really believe in as the story unfolds. Of course, this lukewarm reaction could be because I was reading an equally long book while I was reading this one, so I could be just in the middle of a slump and I was feeling impatient. I did like Insurgent‘s ending though, and it had that second-book-in-trilogy-cliffhanger ending that I kind of expected, like how Mira Grant did it with Deadline. The ending feels like a game-changer and I am curious with how Veronica Roth will run away with this one. 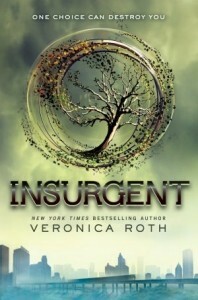 Overall, I liked Insurgent but not as much as I enjoyed the first book. I will still read the last book, just to satisfy my curiosity…but I think I’ll just borrow the next book instead of just buying one for my own. Unless of course the cover convinces me otherwise, that is. It’s been a while since I read some dystopia, and to be perfectly honest, I think I may have lost some of my taste in them. Oh, don’t worry, I still like it a lot, but I guess I have this feeling that I’ve run out of really good and credible ones that make my heart race, or make me rave like the way The Hunger Games or The Knife of Never Letting Go did1.That, and I’ve been enjoying immersing myself in fantasy and contemporary, so that other little sub-genre of seeming despair, destruction and surviving some sort of end of the world or society as we know it has taken a back seat. This pause of dystopia stopped because of Divergent by Veronica Roth. I’ve heard so many good things about this book that it’s made me curious, and it doesn’t really help that the cover of the book looked, well, fiery. Well and fine, so I got the book in hardcover in case it is what everyone said it would be and I’d want to keep a hardbound copy for my collection. In case it wasn’t…well, with bookish friends, it’s become easier to dispose of un-rereadable books. In a future Chicago, the society is divided into five factions that uphold certain virtues that are believed to be a solution to the evil in the society: Candor the honest, Amity the kind, Erudite the intelligent, Abnegation the selfless and Dauntless the brave. Every year, all 16-year-old would take an evaluation that would tell them which virtue they display the most, and are given the choice to choose which faction to live with for the rest of their life. 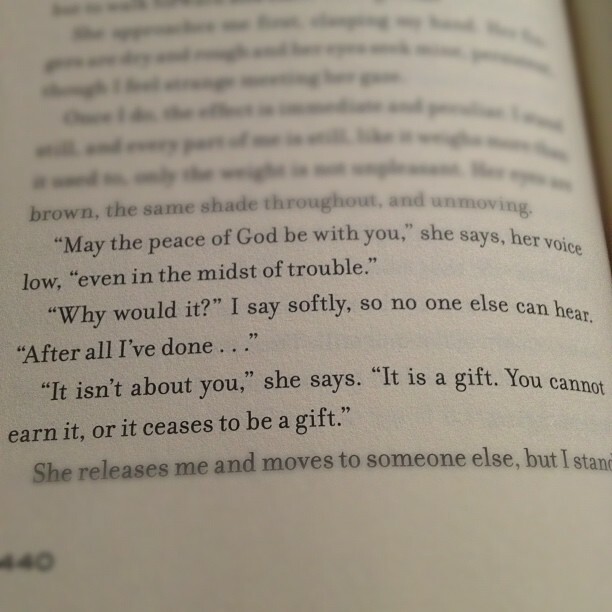 Beatrice Prior is Abnegation, but she knew she was far from selfless. On her choosing ceremony, she leaves her faction and joins the Dauntless, intrigued by their recklessness and bravery. She renames herself as Tris, and what follows is a series of challenges for her and other batch mates for the Dauntless initiation, and surviving it means being able to join the society and upholding the faction’s beliefs. Failure is not an option, as it means either death or worse, factionless — forever shunned by everyone but Abnegation. But Tris has a secret that makes her special and wanted and dangerous, and she discovers that her secret is related to the growing unrest in the seemingly perfect society. I believe in ordinary acts of bravery, in the courage that drives on person to stand up for another. It’s heavy without being really too heavy, if you get what I mean? Tris is also an excellent heroine, IMO. I loved how she’s no pushover, and how she can be cold and calculating and vengeful one time and guilty and compassionate after. I also liked her little group, and the moments she spent with them softened their hard times and gave them a more human side. It somehow reminds the readers that even if they’re being trained to shoot guns and beat other people up, Tris and company are still teenagers. The only other complaint I have in this book is it’s a tad too predictable — two of the three twists I managed to predict pages before it was revealed. I don’t know if it’s the same for everyone, but I guess I managed to pick up on the other clues in the book too easily to predict these twists. Also, I may be one of the few who’s not really that interested in the romance aspect in the story. Not that I thought the guy wasn’t hot — he is, but perhaps he’s just not my type. Heh. Or I’m just nitpicking. Despite all that, Divergent is a fun and addicting read. A little bit on the violent side, but not too gory. To address the question of comparison with other hit dystopias: this book is no Hunger Games, but it’s entertaining. I really like it enough for me to be curious about the rest of the trilogy.